DVI’s Aircraft Wreckage Reconstruction Experts understand that there are many dynamics in play when an aircraft impacts the ground. Oftentimes the aircraft accident investigator is asked to determine the attitude and velocity of the aircraft at the time of the impact, and more importantly make a determination as to whether the impact was survivable. The velocity of the aircraft generally determines the degree of breakup and deformation of the wreckage, whereas the impact angle determines how the wreckage will be distributed. In the simplest form, these calculations can be viewed as an estimation involving deceleration and energy absorption, as a function of the distance the various parts of the aircraft traveled. Pending terrain characteristics, most impacts can be grouped into five categories: 1) High Velocity, High Angle- which is the smoking hole, ie, most of the fuselage followed the nose of the airplane into the hole. 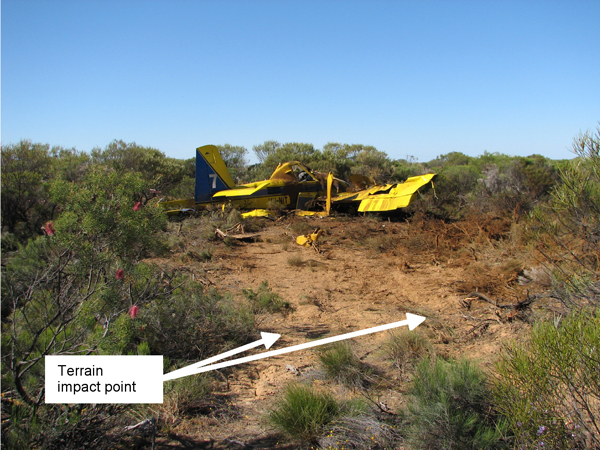 2) High Velocity, Low Angle- the aircraft wreckage pattern is spread along a considerable amount of ground. There is an initial impact scar, and the aircraft starts to come apart and the heaviest portions will travel the farthest. 3) Low Velocity, High Angle- the impact crater will be shallow and the plane will be largely intact. 4) Low Velocity, Low Angle- the aircraft might bounce several times along the ground, shedding parts, but there is not the high velocity type deformation. 5) Stall-Spin- these are essentially low velocity, high angle type impacts, but the aircraft might not strike the ground nose first, and it’s possible sometimes to determine the direction of the spin rotation by airframe deformation. An essential part of the aircraft wreckage reconstruction process includes having the knowledge to identify and interpret the interrelationship between the deformed components. DVI’s Aircraft Wreckage Reconstruction Experts know how to accurately look for the clues (physical evidence) that make it possible to estimate impact attitude, angle, and velocity. DVI’s Aircraft Engine Experts disassembled an engine after the accident aircraft impacted the ground. DVI’s Engine Experts discovered that the engine ingested dirt throughout the engine, and the throttle body and linkage was found in the full open position.